Want to meet your customers’ needs with advanced light and RF technology? Let Viora’s V20 make a difference in your clinic and shape your future! Viora’s V20 multi-technology platform – part of the V-Series – provides treatment solutions for the most requested applications, including hair removal, skin rejuvenation, skin tightening, acne clearance and more! With FDA and CE approvals, V20 give you total control and flexibility. And with the ability to access Viora’s specially-developed combination protocols, superior clinical efficacy and patient satisfaction is waiting for you. The V-ST hand piece for skin tightening utilizes Viora’s proprietary CORE™ technology with three individual RF channels and a fourth channel incorporating all three modes for greater depth penetration and control. 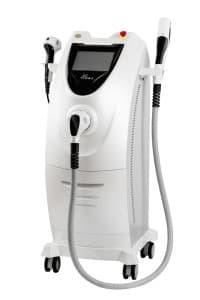 The V-FR hand piece for skin resurfacing, skin rejuvenation and acne scar clearance uses Viora’s innovative SVC™ technology of switching, vacuum and cooling gives physicians greater control by delivering unprecedented penetration depth control, allowing practitioners to determine the desired biological response. Viora capitalizes on the advanced and proprietary technology within V20 by delivering the most effective results possible, quickly, safely, painlessly and with little to no downtime.